Both samples are really springy and softer than I expected. It was an interesting experiment. And I still have several pounds of the CVM left! 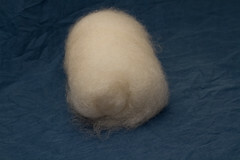 I decided to do both carded and combed samples, to see how the wool behaves when spun. 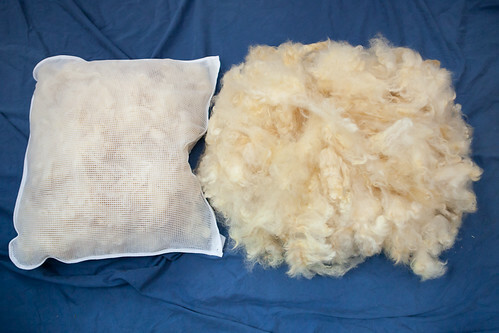 Here is some of the wool loaded on my English combs. 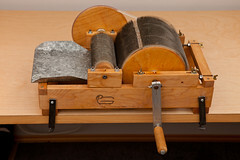 To the left is my drum carder, which I had just used to make a batt. In the bin are the locks I was working with. 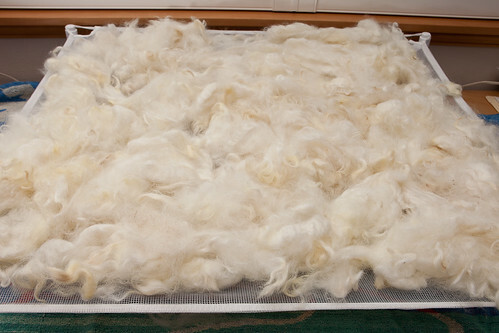 Hand carding and combing can actually be quite time-consuming. By the end of this excercise I had only two ounces of fiber to play with, one in a carded batt and one in several combed slivers. The fiber is a bit neppy, on account of me starting with some of the back and neck fleece, which tends to be somewhat tender and short. We’ll just call it rustic. 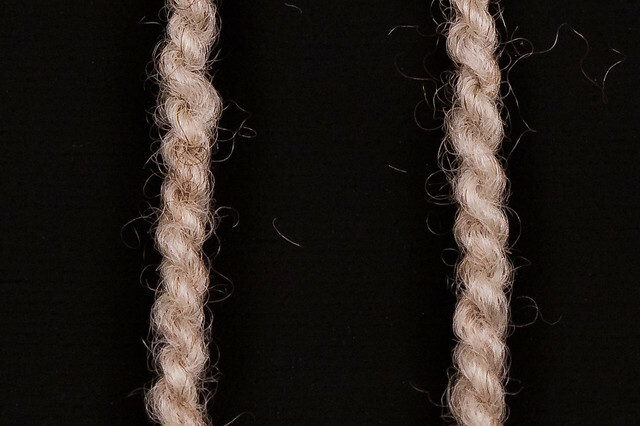 The staples themselves went from dove gray at the cut end through white to cream at the tips, resulting in a light tan color overall when blended. It’s really very nice. I had hoped to finish this week’s Thing by spinning these, going woolen with the batt and worsted with the sliver (two methods of spinning that result in different finished yarns), but I ran out of time. That just leaves me more to do next week! It was gorgeous this weekend so I decided to do something I’ve been wanting to do as soon as the weather got nice: scour some fleece. I know how to have a good time, don’t I? The tips are still pretty crusty. I’ll have to flick them to see if the dirt comes out; otherwise I might have to start trimming. The locks seem sound, soft, and springy, so I should be able to get some nice fiber out of it. I’ll know more when it’s finished drying! I’ve been playing around with that Romney fleece I got late last year. 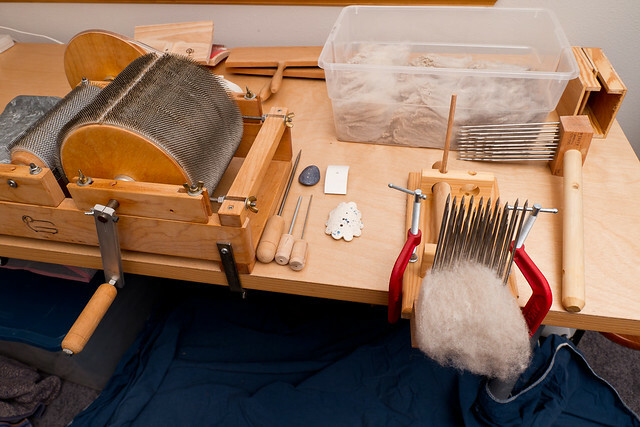 I’ve been doing things here and there since I washed it: I first hand-carded some of it into rolags and spun some test yarn, and more recently I scored a Pat Green drum carder on Craigslist and carded some of the fleece for real. I’ll need some more practice, I think, but I’m pleased with what I’ve done so far. 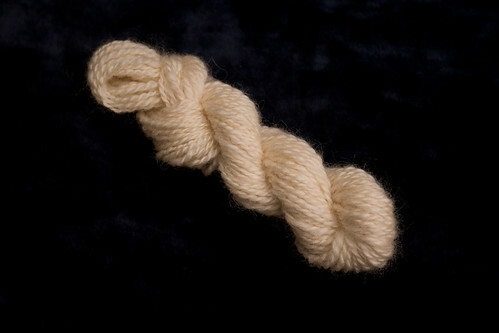 This yarn is around aran to bulky weight, a little thick and thin, very light and lofty. It’s only an ounce and three-quarters, so I’ll have to card and spin up more if I expect to make anything out of it. Still, it’s a start! 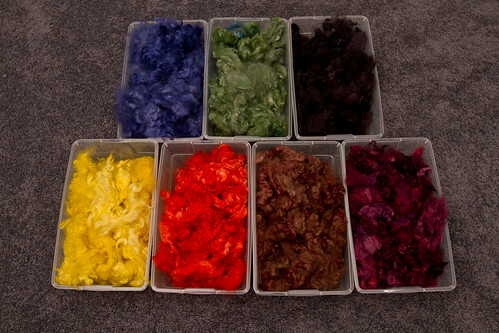 And, over the holidays, I finally broke out the dyes I bought a while ago and dyed up seven 4-ounce batches of fleece in various colors. These were dyed in a crockpot using Dharma dyes. I’ll be carding these as well, and hope to come up with some really pretty batts. Wish me luck! I flicked the tips before putting them in the bags, because during a test run of 1 lb. last weekend, the tips didn’t seem to wash well. To wash, I let it soak for 30 minutes in hot water and Dawn dishwashing detergent in my washing machine, spun it dry, then did it again. 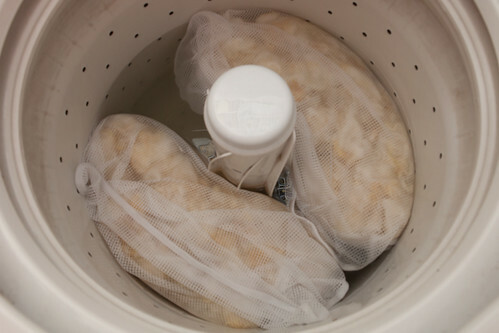 To rinse, I soaked it for 20 minutes in plain warm water, spun it dry, then did it again. After all the water was spun out, I took it upstairs and laid it out on a sweater drying rack. 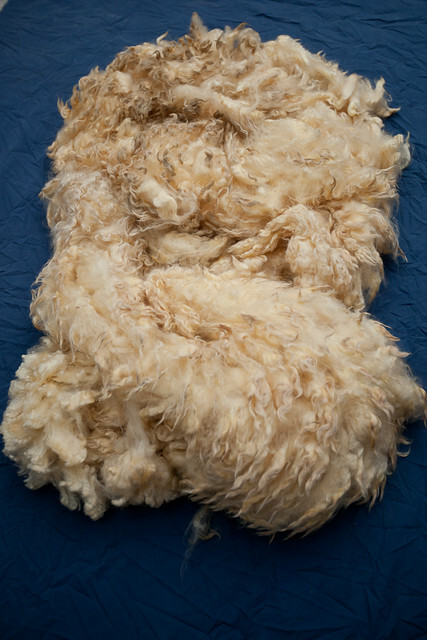 The picture only shows a pound (well, less now that the dirt and lanolin is washed out). The other bundle is drying in a kid’s toy net hanging under my table. 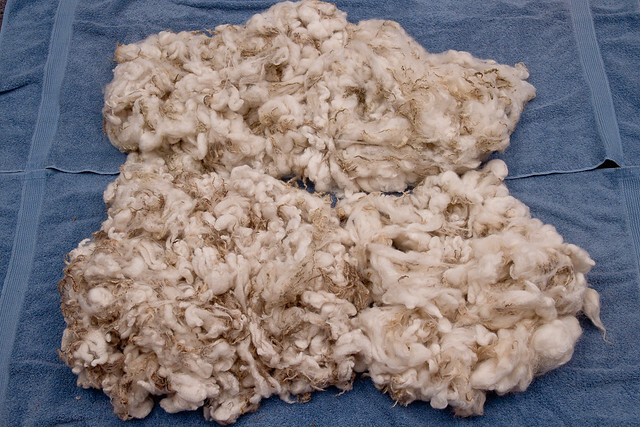 The fleece got a really nice white, though some of the tips are a little yellow. 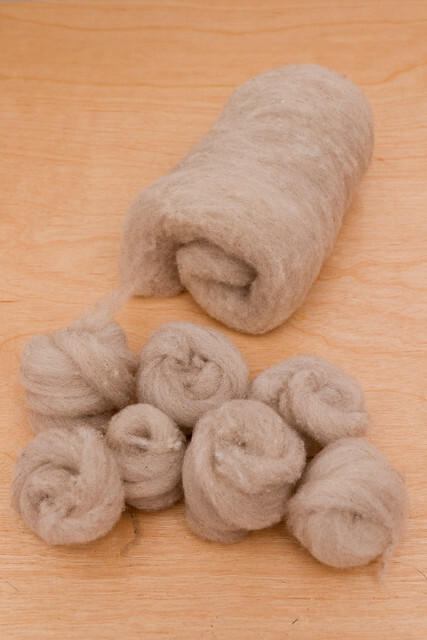 That should blend fine when it’s carded, as the wool itself is undamaged. 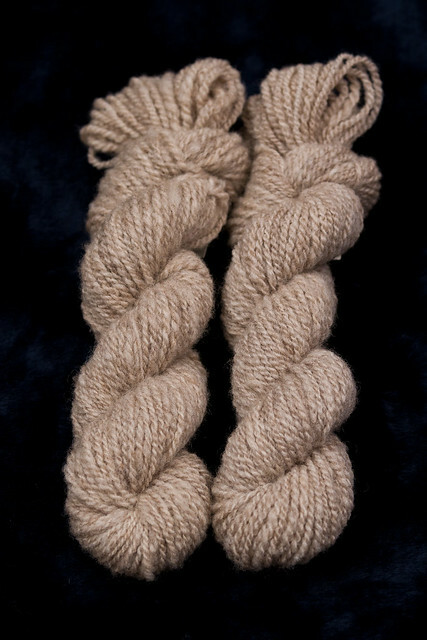 I haven’t decided whether I’m going to dye this batch or just try spinning it undyed. We’ll see! 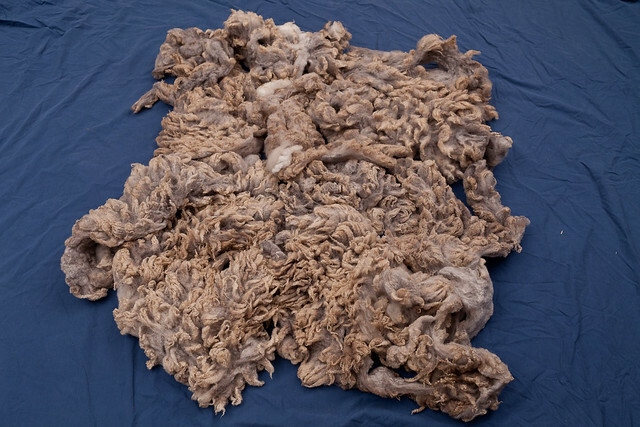 Well, as if all this spinning and knitting isn’t enough, I decided I’m going to try processing some raw fleece. I know, what’s wrong with me? I can barely keep up with the hobbies I have! 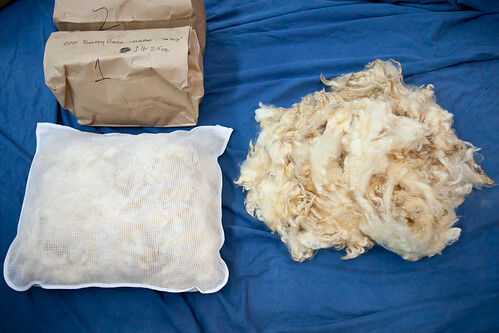 Anyway, I scored about 5 lbs of very clean Romney fleece this week on Craigslist. The sheep’s name is Valerie, and the fleece was taken this year. It was covered, so veggie matter is minimal, and already skirted and sorted. It looks like it’ll be a lovely creamy white after it’s clean. Speaking of cleaning, that’s next. That’ll be an adventure as well. It has a lot of lanolin in it, so it smells very sheepy! After I wash it, I’ll need to card it, and spin. I might try dyeing some of it too. Wish me luck!